Premier Rachel Notley says United Conservative Party Leader Jason Kenney needs to stop allowing people with racist and homophobic views from running in nominations, and take a stronger stand against groups like the Soldiers of Odin. Premier Rachel Notley says United Conservative Party leader Jason Kenney needs to stop allowing people with racist and homophobic views from running in nominations — and take a stronger stand against groups like the Soldiers of Odin. "The question is, why are these folks showing up at these events and feeling as though they are welcome?" Notley said Tuesday. "If you use dog-whistle politics often enough, eventually, soon enough, people are going to respond to the whistle." 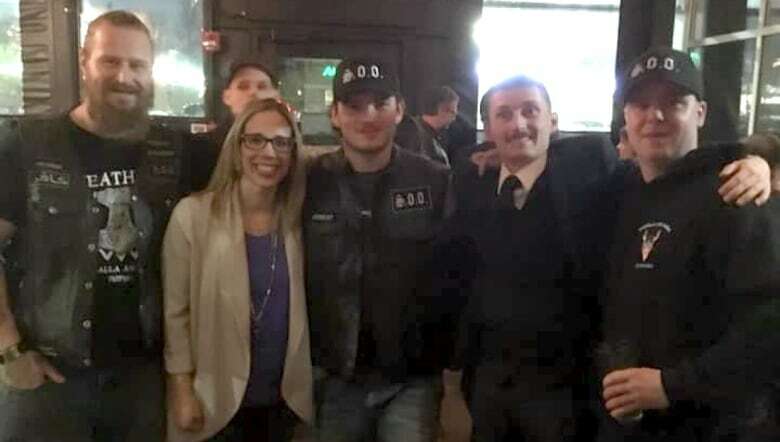 Notley's news conference comes after three UCP Edmonton-West Henday candidates — Nicole Williams, Lance Coulter and Leila Houle — each posed with Soldiers of Odin members at a UCP pub night in Edmonton. The photos started circulating on social media Sunday. Notley said Kenney needs to clarify how this will never happen again, saying elected officials need to call out hate when they see it. "This is very serious and should not be downplayed. Alberta's minority communities need to know that their government stands with them. That every elected official stands with then whatever party they belong to," Notley said. "There is no place for groups like the Soldiers of Odin in our public life." Soldiers of Odin is an anti-immigration group founded in 2015 in Finland by Mika Ranta, a white supremacist. Canadian branches of the group claim to be non-racist conservatives who seek to keep Canada safe. After speaking at a Calgary Chamber event on Tuesday, Kenney said he was disappointed to see Notley engaging in "gutter politics." "It would be nicer if the premier were to actually stand in solidarity with our Aboriginal nomination candidates who were obviously the targets of political mischief," he said. 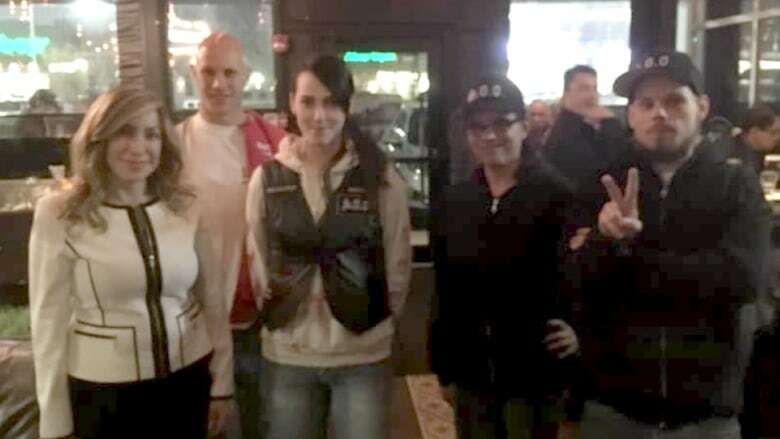 Kenney repeated the explanation he provided Sunday on Twitter, that supporters of the Alberta Independence Party "who are apparently are associated with various kooky organizations" crashed the pub night to take photos with the candidates. His tweet stated: "We obviously condemn any group that promote racial prejudice. Members of the Alberta Independence Party and groups like the Soldiers of Odin are not welcome at UCP events, period." Alberta chapter president Tyson Hunt told CBC News the Soldiers of Odin informed the UCP one week in advance that they intended to attend the pub night. "So they knew we were there. We weren't hiding. We never snuck in," Hunt said on Tuesday while awaiting a tour of the Alberta Legislature. Hunt said the Soldiers of Odin colours are emblazoned on the backs of their jackets "clear as day," and the group sought prior approval from the bar to show their colours before attending the Edmonton event. Hunt added that it comes as no surprise that Kenney is distancing himself from the group. "For us to be denounced and thrown under the bus like that, eh, it's just another day in the office. We get it all the time." Although the candidates claimed they did not know who the group was and what it espoused, the issue has touched off a storm of controversy. Notley said the UCP could be given the benefit of the doubt if it was a one-time event. But she says eight UCP nomination candidates were exposed in recent months for holding homophobic or racist views. Six were allowed to run. "As a public official, Mr. Kenney has to a duty to do more than tweet his disavowal," Notley said. "He needs to speak forcefully and decisively to the issue. He needs to hold people accountable. And he needs to stop approving candidates for nomination who espouse hate in any of its forms."